Samuel Grafton, who lived on Barry Avenue from 1948 until 1962, was a prolific writer who was accomplished in many genres. He wrote a nationally syndicated current affairs column, penned several books on politics and economics, freelanced for magazines, published a popular mystery novel, scripted television dramas, and with his wife, Edith, wrote a Broadway play. Born in Brooklyn in 1907, Mr. Grafton grew up in Philadelphia, and began writing for The New Republic when he was only a teenager. In 1929, the year he graduated from the University of Pennsylvania, he won a $500 prize ($7,000 in 2016 dollars) from the American Mercury magazine in a contest for an article on the faults of American higher education. He had planned to go to law school but was swayed by the editor of the Philadelphia Record to join his staff; Grafton became an editorial writer there from 1929 to 1934. He then signed on as an editor of The New York Post and in 1939 began a daily column that appeared in 120 newspapers for more than 10 years. Despite its name, “I’d Rather Be Right,” the column had a liberal bent. The name played on the old adage, “I’d rather be right than president,” but was also meant to reflect the fact that he truly believed all his opinions were absolutely correct. Early in World War II, Mr. Grafton was the leading American journalist supporting de Gaulle and the Free French, and denouncing Vichy as a Fascist front. For this, he later received the French Legion of Honor. While a Ridgefielder he often wrote for major magazines, including Look, McCall’s, Saturday Evening Post, and even TV Guide. During the 1950s, he also wrote dramas for television shows, including Kraft Theatre and General Electric Theater. 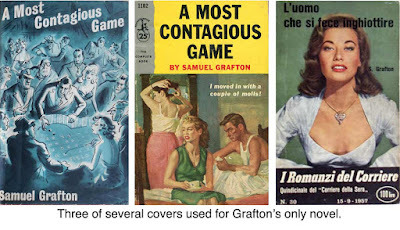 In 1955, Mr. Grafton published a mystery novel, “A Most Contagious Game,” about a magazine reporter who joined the New York City underworld to get his story. The book got good reviews, sold well here and abroad, and was made into a television drama broadcast on Westinghouse Studio One in October of that year. After leaving Ridgefield, he and his wife founded Grafton Publications, a small firm that produced newsletters on youth and drug addiction. He died in 1997 at the age of 90 and Edith in 2000. Their son, Dr. Anthony Grafton, who grew up here, became Dodge Professor of History at Princeton, and author of 10 books of history. Son John was an executive with Dover Publications and daughter Abigail, a clinical psychologist and organization consultant in Berkeley, Calif.